Imagine that I’ve invited you into my home for dessert and coffee. What a lovely idea! I show you to the dining table which is already set. On the table in front of each seat are two place settings. One is fine china and the other is plastic. The choice is yours as to which setting you use. For years I kept a china place setting and a plastic place setting on the hearth of my family room fireplace. Each morning when I spent time in God’s presence, I knelt before the hearth. I had a choice to make between living that day as God’s child in His royal family or to live that day believing lies that I was less than who God created me to be. I have that choice every day. 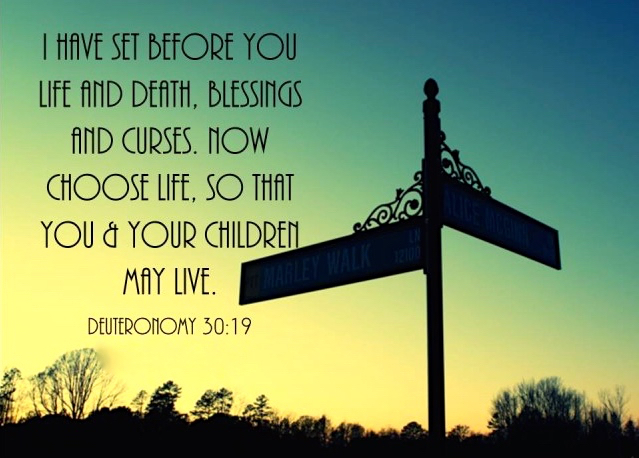 Will I choose life and blessings or death and curses? Choosing life in Christ daily shows my heavenly Father my complete dependence on Him. Yes, He has saved me by grace, once for all time, but it’s up to me to choose the fullness of life I live. As Deuteronomy 30:19 states, an additional result is that my children will live! My decisions each day impact generations to come. Lord, Thank You for setting life and blessings before me. May I choose life daily.